Who do you think you might encounter on our Mayfair Treasure Hunt. Gordon Ramsey? Stella McCartney? Nicky Clarke? Guy Ritchie? Mr. Blobby? Harold Macmillan? Archibald Primrose (who he?)? Well, the honest truth is that you stand a good chance of meeting them all - with the exceptions of Harold Macmillan and Archibald Primrose (who he?) as they are both dead. But then again, since the most haunted house in London is also included on the Mayfair London Treasure hunt... who knows? Mayfair is rich list London par exceptional. It is where the super wealthy have always come, to let their hair down as they party, relax and to do whatever else the super wealthy like to do behind closed doors, and with the odd super injunction firmly in place to avoid the prying eyes of the over curious. But prying eyes are what you will most certainly need if you are to seek out the solutions to the treasure hunt clues, or are to sniff out the answers to a plethora of observation questions, or are to solve the cunningly devious photo challenges that will be set you. Gordon Ramsey makes an appearance (in name at least) quite early on in the Mayfair Treasure Hunt. So too do Jimi Hendrix and George Frideric Handel. IS THAT GUY RITCHIE BEHIND THE BAR? Later on in your quest to become the supremos of the Mayfair Treasure hunt, you will find yourself outside Guy Ritchie's former pub - you might even like to pop inside for a sit down and a drink in the hope that a bit of Sherlock Holmes's talent for observation and deduction might rub off on you! But, then again, since time is of the essence - and the other teams are hot on your trail, or even slightly in front of you, you might just like to leave matters alabandical and hirsute for a return visit and, instead, concentrate on ensuring that your team is victorious. WHAT DID HAROLD MACMILLAN THINK? To give you some idea of the challenge that awaits you, when we were testing out the Mayfair Treasure Hunt we decided to ask Harold Macmillan to read over the clues and see what he thought of them. You can see his reaction on the picture to the right! Okay, we made that bit up. 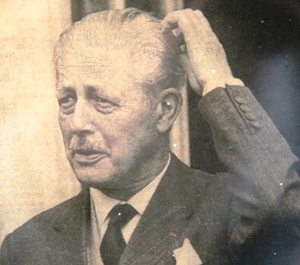 Harold Macmillan wasn't involved in any way in the creation of the Mayfair Treasure Hunt, but the picture was just too good to waste and you will, in fact, come across it en route. You'll also encounter old Harold himself as well, although we can't say too much about the context in which your paths will cross as, if we did, we'd give away the solution to a rather good clue on the Mayfair Treasure Hunt. Why the Taj Mahal's sales were zero on the day it opened? 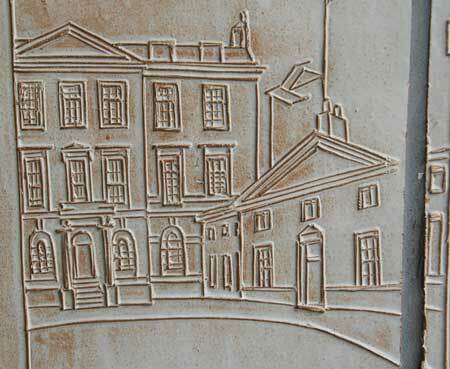 What became of Mayfair's oldest house? 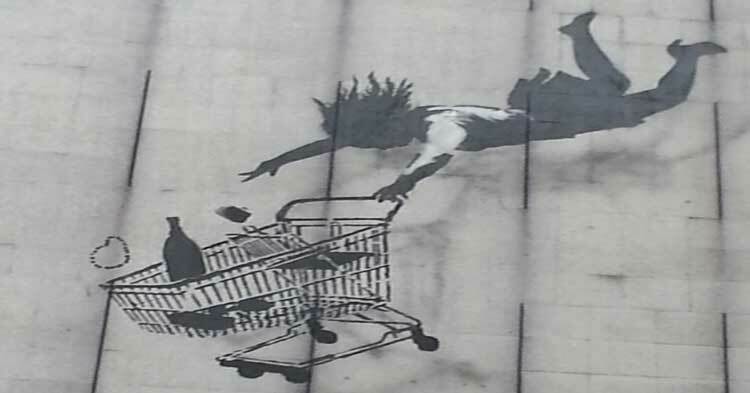 What is going on with the falling shopping trolley to the right? What was closed down because of the shocking behaviour of its habitués? Which Mayfair emporium once served "delightful ladies"? Who is the man who can legitimately say "cobblers to the German Ambassador" without causing a diplomatic incident? Well, you will once you've completed the Mayfair Treasure hunt. As with all our treasure hunts the Mayfair quest is meant to be both fun and educational. It's not too difficult to compete or complete. You will need to work with your team mates to spot the solutions to the Cryptic Clues that will help get you around the route. Since these are all visual you won't require any prior knowledge of Mayfair, nor of the history of Mayfair. A keen eye, a little deduction and boundless curiosity are all that are required to get you round the route. You will also have to find the answers to 20 observation questions. At first glance these can seem pretty daunting - yet the answers are all there for you to find as you go round. They might be tucked away in some lovely gardens, hidden on the plinths of some fine looking statues, or they may be displayed on blue plaques or information boards that adorn the fantastic properties that you encounter in the course of your Mayfair Treasure Hunt. The same applies to the 10 photo challenge questions that your team will be set. These are photographs of things you will pass as you make your way around the treasure hunt route but which have been photographed from odd angles, or even tampered with slightly to make identification something of a challenge. But, they are most certainly there somewhere on the route and, when you spot them, answering the questions about them should be a breeze. So, whether you're looking for a great celebrity spotting, team building activity, a birthday, hen or stag do, or you just want an intriguing afternoon or evening's entertainment exploring one of London's classiest quarters with a group of friends - park the Porsche (you'll have to jostle with the Ferraris and the Bentleys to get a space), take yourself along to Bond Street Underground Station, and prepare to get those little grey cells working overtime as you set off on the informative, entertaining and, above all else, thoroughly fun and entertaining Mayfair Treasure Hunt. What ho! A great treasure hunt is all about friendly competition. Yes, you might go out of your way to nobble the opposition when you're out there on the wild streets of Mayfair. But, once the dust has settled, the feet have been put up, and the sheets have been marked, all that ruthlessness can be put aside as you all become one harmonious group gathered together at the end venue congratulating each other on a team building exercise well done and each one of you united in praise of the resilience and effort shown by the winning team with not the slightest hint of jealousy, or the desire for a re-match, being allowed to dampen your feeling of goodwill to all teams. Yeah, right! The cost of the Mayfair Self Managed Treasure Hunt Package is £140.00 for 4 packs. junction of Oxford Street and South Molton Street.